(TB30DPA) GeoCoins.net Trackable Token Geocoin - Todie's Wild Ride II: Please drive responsibly! Todie's Wild Ride II: Please drive responsibly! In the hands of LaChelaLoca. Use TB30DPA to reference this item. 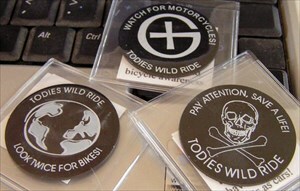 Gallery Images related to Todie's Wild Ride II: Please drive responsibly! Nice trackable. Catching up on my logging. Thanks for sharing. Found this special coin and have plans to add a few miles to its journey, Will take it to Jamaica next week!! What a nice way to memoralize a loved one! I'm so sorry about Tod. Hopefully this trackable will help spread awareness. I'll move it along very soon. Received from Ms. Froggy in Auburn Wa. I'll be taking to GeoWoodstock VIII for more adventures. Picked this one up at GW8 and will take it back to Canada with us, to continue it's journey.